Jordan Hamilton puts up a floater. The sophomore guard hit a game-tying shot with 0.8 seconds remaining. Trailing by 11 with just three minutes to play Sunday, Northwestern could have given up. Instead, the Wildcats turned up the defensive pressure and pulled out a win. NU ended regulation on a 13-2 run, with sophomore guard Jordan Hamilton putting the exclamation mark on the rally by making a layup with less than a second remaining to tie the game at 72. The Cats (4-0) then outscored host Florida 11-2 in overtime to stun the Gators in Gainesville, 83-74. Things looked dire for NU after Florida’s sharpshooting guard Funda Nakkasoglu hit a 3-pointer with 4:15 left to put her team up by 10. Nakkasoglu had a game-high 26 points on 9-for-13 shooting. The Cats’ deficit grew to 11 a minute later before NU began chipping away. Sophomore guard Lindsey Pulliam, who led the Cats with 22 points, got things started with a layup. Following a string of defensive stops, senior forward Pallas Kunaiyi-Akpanah made a layup of her own, and then junior forward Abi Scheid converted a 3-point play to pull NU within 70-66. Jumpers by Hamilton and then Pulliam tied the game with 46 seconds left, forcing the reeling Gators (0-4) to call timeout. Florida retook the lead on its next possession on a layup by forward Kristina Moore, but the Cats had an answer, with Hamilton scoring with 0.8 seconds on the clock to force overtime. The extra period was anti-climatic, with NU taking the lead on its first possession on a Kunaiyi-Akpanah layup. The Cats did not trail again. A clutch 3-pointer by Scheid with under two minutes left stretched the lead to 79-74, and NU was never really threatened after that. The Cats’ four stars all finished in double figures. In addition to Pulliam’s 22, Scheid and Kunaiyi-Akpanah had 18 points apiece and Hamilton chipped in with 16. Kunaiyi-Akpanah also had 13 rebounds to give her yet another double-double, her third in the season’s first four games. 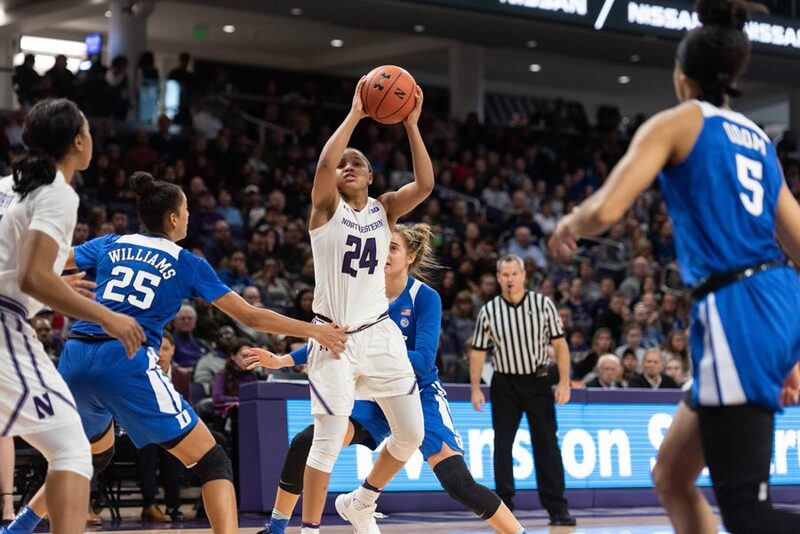 The production out of NU’s top players was especially impressive considering the fact that Kunaiyi-Akpanah, Scheid and Hamilton were all playing key minutes down the stretch with four fouls. The game was a back-and-forth affair for most of the afternoon, with Florida using late spurts to pull ahead at the end of each of the first three quarters. The Gators went on a 8-2 run to take a four-point lead after one and a 12-5 stretch to go up 33-29 at halftime. After the Cats started the second half hot to briefly pull ahead, Florida, keyed by forward Zada Williams’ 14 points off the bench on 7-for-9 shooting, bounced back to take a six-point lead after the third quarter. The Gators continued to stretch their advantage in the fourth before NU staged its furious comeback.